The Mosquito Insect Eliminator effectively eliminates mosquitoes and other flying insects. Coverage up to one acre. The Mosquito Trap operates economically and is easy to install. Eliminates insects without chemicals being added to the environment or the surrounding areas of usage. 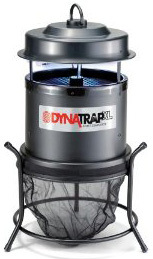 The DT2000XL offers a 3-way protection plan for insect elimination. Two UV fluorescent bulbs produce warm light to attract insects to the TRAP. The Ti02 titanium dioxide exclusive coated funnel produces C02 which is irresistible to mosquitoes luring the insects to the powerful yet whisper quiet vacuum fan. Insects are collected and trapped into the retaining cage away from the area of usage providing the user safe pest protection and comfortable living quarters.